Following our post last year on Google UK’s market share in 2007, here are some figures providing an indication of Google’s Market share in the UK in 2008. Hitwise are providing the numbers again, and in a relatively short sampling period during March 2008, they found Google to be holding a market share 87.5%, 10 percentage points greater than the same figures for 2007. They found 73.7% to be using google.co.uk, and 13.8% google.com. Clearly Yahoo, Microsoft and Ask among others have therefore lost ground to their primary competitor. These statistics source from a compilation of SERPS behaviour studies for which I’ve listed source information at the end of the article. If you disagree with a figure, or have additional figures or sources, please do post them to the discussion. 42% of search users click the top-ranking link. 8% click the second-ranking link, and the click-through rate (CTR) continues to drop thereof. When these two top-ranking links are artificially switched, the click-through ratio of 42-8% drops to 34-12%, demonstrating the importance of engaging copy in addition to rank position. The latest figures on Google’s market share compared to its primary search competitors Yahoo, MSN, and Ask (formerly Ask Jeeves) have been published by Hitwise. As always, the numbers are astounding, revealing that Google holds a 77% market share, meaning overthree quarters of UK internet searches are made through Google. Yahoo is now holding 8%, and while MSN and Ask are both at 5% and falling. Comparing the UK to the US figures, for which Google has just broken 66.6% or two thirds market share, it’s clear that UK internet searchers even more than US searchers turn first to Google. 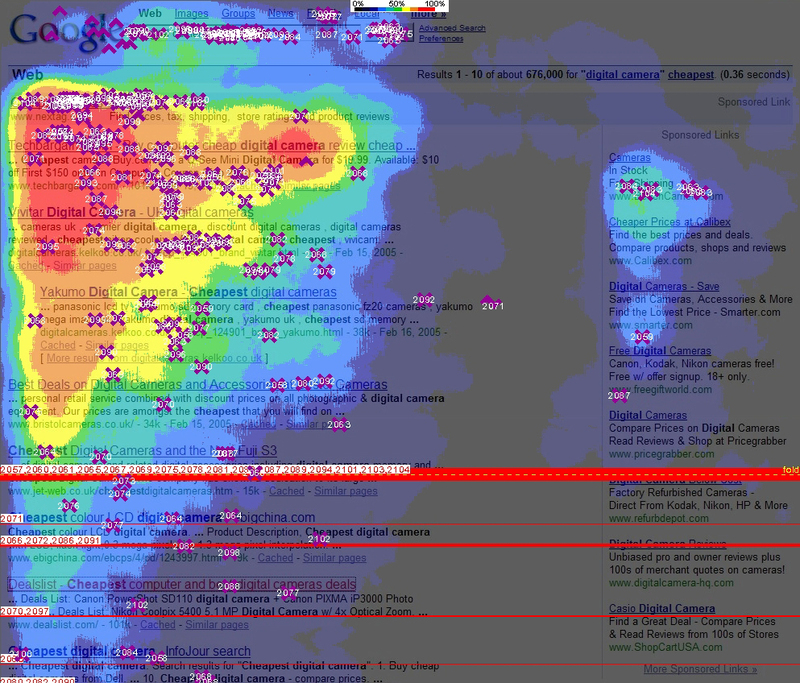 This is a great image from an eye-tracking experiment that clearly demonstrates the importance of organic SEO. Check it out. From the same conference, Andy Budd summarises and presents links to several other presentations from industry spokespeople. A critical part of being a web design expert and consultant in Glasgow is actively participating in communities of other web design experts. To get an idea of the expertise we are drawing on and contributing to, the following is a list of those sites we consider key to our success – the best of the best, you might say.